I was going to post some of these images on Wednesday last week for a wordless Wednesday post, but I was having a few site issues, and just didn’t have the patience to wait while WordPress loaded slowly. So instead, I’ve gone through my images and found a few more hummingbird images and am sharing them all today. While I was in Southern California, I enjoyed my morning coffee on the patio, and loved watching the hummingbirds fighting over the best spots at the feeders and various flowering bushes. I also noticed how chattery the Costa’s hummingbirds are. They spent a lot of time singing from the branches of the bushes in the garden. The link below is the All About Birds page for the Costa’s hummingbird, and you can hear what they sound like there. Seeing these images makes me long for spring even more, when the Rufous hummingbirds return to Prince George for another (short) spring and summer season. One of the projects that I undertake in December, for myself and a few family and friends is creating custom calendars; formatted both for hanging on a wall (I use a clipboard) or smaller sized to fit in freestanding wood blocks. This year I’ve decided to share them on the blog, for anyone that would like to have one. January and February for the half fold calendar is shown below. They are sized for 11″ x 8 1/2″ paper; I use cardstock to print them. March and April will be included in my February Month in Review post. Wishing everyone a fantastic year ahead. Last week I decided I would play around with one of the new features in Luminar, a filter called AI Sky Enhancer. Perhaps the timing wasn’t so good though, as yesterday evening I downloaded the newly release Luminar 3, and with the added library function, I was having a bit of trouble navigating the system (since I haven’t yet looked at any resources on how to use the new software). Despite a bit of floundering within the libraries function, the actual photo editing and filters layout remains the same, and I was able to complete my self-appointed task. This first image wasn’t solely about the sky; it’s kind of hard to ignore the leopard in the tree! I wanted to enhance the natural colours of the sky and bring up some of the shadow areas. I started with the AI Sky Enhancer and added other filters as needed (which was how I approached all the images). I’ve included a split screen showing before and after and the edited image for each one I worked on. 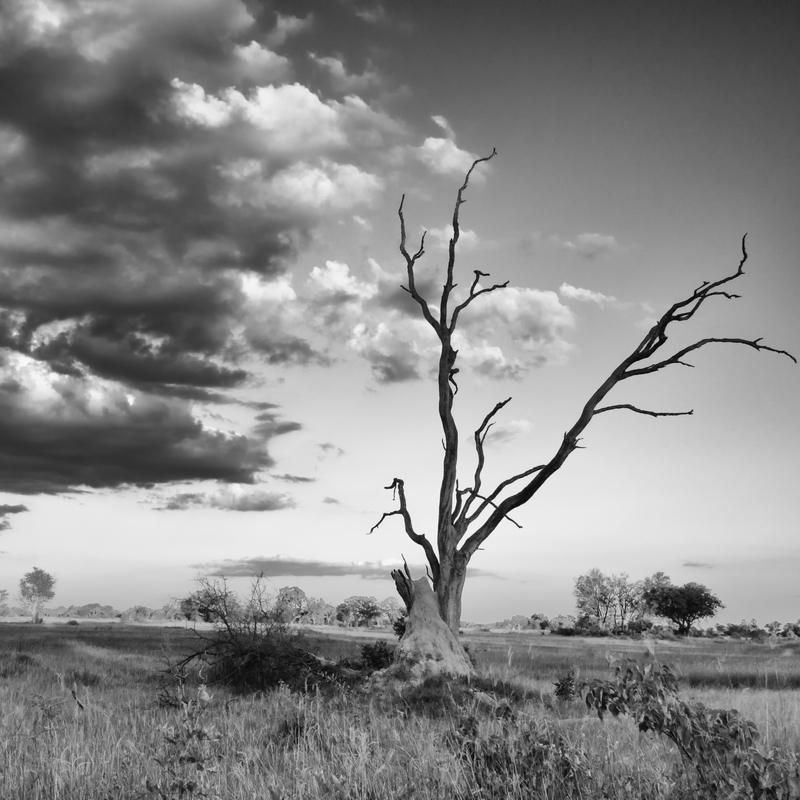 Next up is a photo shot while on a boat on the Boteti River in Botswana. Shooting into the sun left the sky quite washed out; I am impressed how well I could enhance the sky colour and the clouds with Luminar without it becoming to HDR-like. The Okavango Delta is an amazing place for sunsets; the colours in the sky are incredibly dramatic from my experience. With that much colour already, it is easy to take the image a step too far and have it look radioactive. The AI sky enhancer did a great job accentuating the detail in the clouds, without pumping the colour up to 11. Finally I have included a sunset from the Hoanib desert in Namibia. There was a lot of airborne dust and sand that evening, so while I did do some noise reduction in the sky to reduce the visible grain, there is definitely still a lot of texture. This was also shot with my Panasonic camera, which is much noisier than the Nikon I was also shooting with. Regardless, I am please with the realistic tones, the detail in the clouds and the textures in the desert and the hills. I’m going to ow have to spend some time familiarizing myself with the layout of the new Luminar software, so I can work using their library function in an efficient manner.